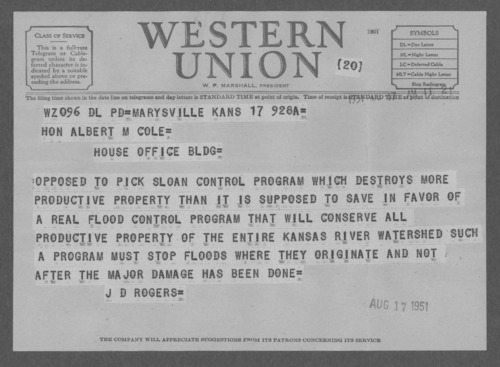 This is a telegram from J. D. Rogers, Marysville, Kansas to United States Representative Albert Cole. Rogers writes that he is opposed to the Pick-Sloan Missouri Basin Program which he believes will destroy more productive property than it will save. He is in favor of a flood control program that will conserve all productive property in the entire Kansas River watershed.